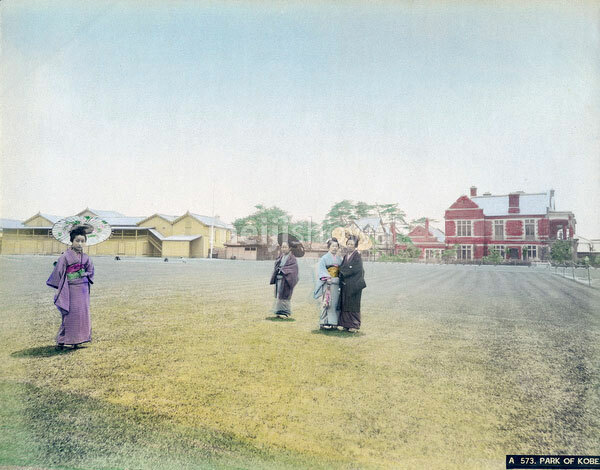 Four Japanese women in kimono at the East Recreation Ground (the current Higashi Yuenchi Park) in Kobe, Hyogo Prefecture. The brick building in the background is the Kobe Club ( 神戸外人クラブ), an elite club for foreign residents. The club was launched in 1890 (Meiji 23) and designed by British architect Alexander Nelson Hansell (アレクサンダー・ネルソン・ハンセル, 1857-1940). The building on the left is the Kobe Regatta and Athletic Club (KRAC).